Day 1 - Cairo at leisure. Your complimentary, private transfer takes you to your local departure airport. Welcome to Egypt - a mystical and timeless land, where the ancient and modern world live side by side. On arrival in Cairo, you will be met at the airport and transferred to your elegant hotel. Day 2 - Cairo sightseeing. Day 3 - Join your cruise in Luxor. Day 4 - The Temple of Hathor and Luxor. Day 5 - The West Bank and Valley of the Kings. Day 6 - A Felucca around Kitchener’s Island. Day 7 - Aswan and High Dam. Day 8 - Relax upon the Nile. Day 9 - From Esna to Luxor. Day 11 - Return to Cairo. Day 12 - Depart Cairo. Nile Cruise: Enjoy an on-board Gala Reception and dinner. Nile Cruise: Join the fun at an Egyptian dinner and galabeya party. Nile Cruise: Enjoy an evening of dinner and traditional Egyptian belly dancing. Nile Cruise: Enjoy dinner accompanied by a Nubian folklore show. Dining Summary: 11 Breakfasts (B), 7 Lunches (L), 1 Afternoon Tea (AT), 7 Dinners (D) all with bottled water, tea or coffee. 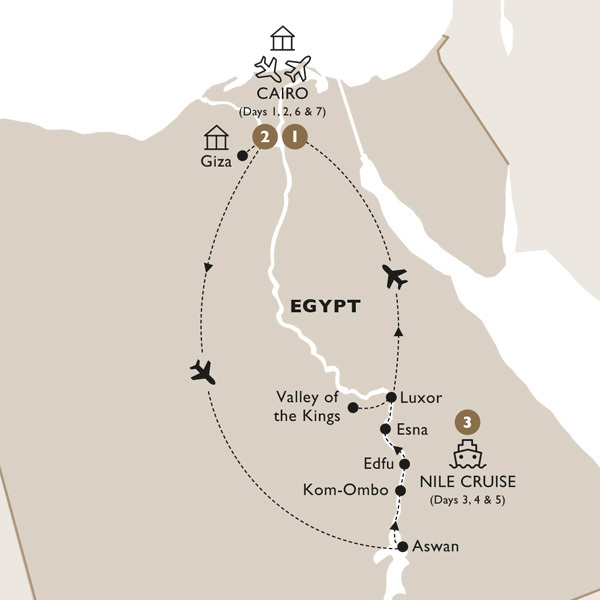 Luxor: Catch your final glimpse of the Nile onboard your included flight back to Cairo. Cairo: Sightseeing with your Travelling Concierge includes a visit to the Citadel along with Mohammed Ali's Alabaster Mosque and a visit to the Khan El Halili bazaar. Cairo: At the Egyptian Museum, with your Local Expert, gaze upon upon the most recognisable symbols of ancient Egypt: the full-faced funeral mask, gold coffin, gilded throne and precious jewellery – Tutankhamun’s treasures. Sakkara: Witness the Step Pyramid of King Zoser that dates back over 4,700 years. Memphis: Led by your Travelling Concierge, explore this ancient capital and see the magnificent statue of Ramses II and the Alabaster Sphinx. Cairo: Board your included flight to reach Luxor. Dendera: Visit the Temple of Hathor and see the rare depiction of Cleopatra VII and Caesarian. Luxor: Visit the Temple of Luxor, a UNESCO World Heritage Site. West Bank: See the might Colossi of Memnon, guarded by two giant seated figures of Amenhotep III. Valley of the Kings: Embark on an experience with an Egyptologist as you venture to the Necropolis where many Pharaohs were laid to rest. See the royal tombs and visit the Temple of Hatshepsut. Kitchener's Island: On a traditional Nile felucca, meet a sailor and learn the art of sailing this ancient Nile craft as you cruise around Kitchener's Island. Aswan: During your visit to Aswan High Dam and the granite quarries, witness one of Queen Hatshepsut's unfinished obelisk. Philae Island: Travel by motorboat to the island of Philae and visit the Temple of Isis which appears to rise from the waters. Aswan: Travel to a small Nubian village, visit a traditional dwelling of a local family and enjoy Nubian-style hospitality. Kom Ombo: Learn about the only temple in Egypt that is dedicated to two gods. Esna: Visit Esna Temple, dedicated to the God of creation, and Esna Lock. Cairo: Overlooking the magnificent River Nile, the Conrad Cairo is centrally located and offers premium rooms, elegant dining and 24-hour entertainment with a glamorous International Casino. Luxor: The opulent five-star Winter Palace Luxor blends rich colonial design with the glory of Pharaonic times. Set amid luxuriant tropical gardens, this hotel offers the perfect retreat after a busy and exciting day exploring. Cruising: For the ultimate in luxury and refinement, set sail aboard the deluxe all-suite River Tosca. Experience old-world elegance, blended with modern amenities and comfort. The spacious suites are tastefully designed with marble bathrooms. Outside on the sun deck, the pool and shaded cabanas offer an oasis of calm to relax and enjoy the ever-changing scenery. Enjoy the comfort of Luxury Gold's air-conditioned coach with onboard restroom and complimentary bottled water for you to enjoy while travelling. See Notes in the pricing panel for exemptions. From time to time, your Travel Concierge will enchant you with a Luxury Gold Flourish, which is a local specialty representing the destination.